Organized tours are the safest way to know the mysteries and energy of Machu Picchu. In addition, if you hire the help of a tour guide, you can better understand the wonderful and legendary Inca structures. But what tour to choose? Why choose a tour to Machu Picchu? How many tours to Machu Picchu are there? How much do the tours to Machu Picchu cost? What is the best tour to Machu Picchu? How to contract a tour to Machu Picchu from Lima? How to contract a tour to Machu Picchu from Cusco? How to hire a tour guide in Machu Picchu? What tour to Machu Picchu to choose for seniors? What tour to Machu Picchu to choose for children? Travel to Machu Picchu with a tour or on your own? An organized tour to Machu Picchu is the best way to visit for people who do it for the first time. The main reason is how difficult it is to get to Machu Picchu: trip to Cusco, trip to Ollantaytambo, trip to Aguas Calientes and from there to the Inca City. Organized tours include: transportation, tickets, tour guide service and, occasionally, lunch. There are some tours that can only be done with an organized tour like the famous Inca Trail (4 days and 3 nights of trekking to Machu Picchu). There is a variety of tours to choose from. From economic services to all-inclusive private services. The most recommended Machu Picchu tours are the 1 and 2 day tours. In addition, you can add to these tours, several of the main attractions of Cusco: Pisac, Ollantaytambo, Sacred Valley, etc. The 1 day Machu Picchu tour (Full Day) includes travel by train, bus, tickets and tour guide service. The tour has a simple difficulty level. 5 am – Pick up from the visitor from your hotel. 5.30 am – 7.30 am – Transfer by bus to Ollantaytambo station. 7.45 am – 9.15 am – Travel by train to Aguas Calientes station. 9.30 am – 10 am – Travel by bus from Aguas Calientes to Machu Picchu. 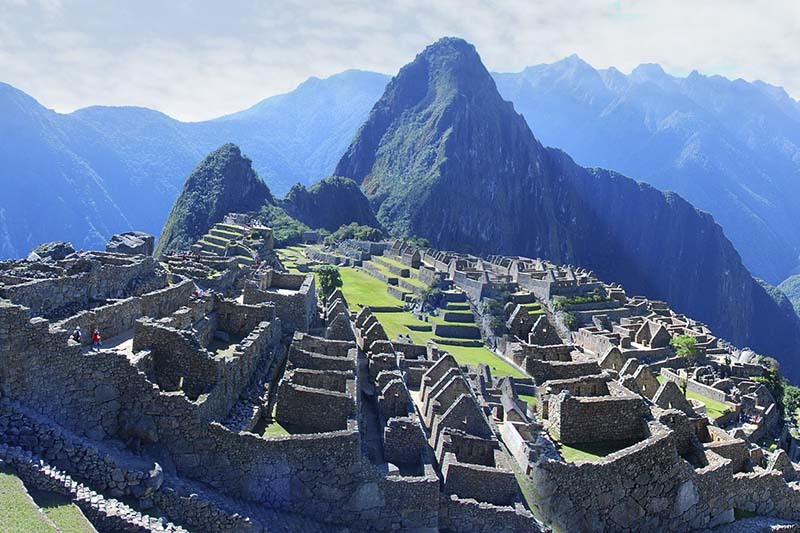 10 am – 12 pm – Visit to Machu Picchu with tour guide. 1 pm – 6 pm – Free time in Machu Picchu and Aguas Calientes. 6.20 pm – 10 pm – Return to Cusco (in the same way as the one-way trip). This tour is perfect for visitors who have little time. The 1-day Machu Picchu tours are the most economical. This tour can be booked a few days in advance. The 2 day Machu Picchu tour most requested by visitors is which includes Machu Picchu and Huayna Picchu. These tours include transportation by bus, train, lunch, lodging, tickets and tourist guide service in Machu Picchu. Day 1 is dedicated to Machu Picchu. Day 2 is the visit to Huayna Picchu. This tour has a moderate difficulty. 5.30 am – 9.15 am – Travel by bus to Ollantaytambo and by train to Aguas Calientes. 10 am – 1 pm – Tour with a tourist guide through Machu Picchu. 1 pm – 5 pm – Free time to visit Aguas Calientes. 6 pm – Lodging in Aguas Calientes. 6 am – Travel by bus from Aguas Calientes to Machu Picchu. 7 am – 8 am Entrance to the Huayna Picchu mountain. 11 am 1 pm – Free time at Huayna Picchu and Machu Picchu. 1 pm – 6 pm – Free time in Aguas Calientes. 6 pm – 10 pm – Return by train to Ollantaytambo and bus to Cusco. This tour is ideal for young people looking for a little adventure in Machu Picchu. The 2-day Machu Picchu tour allows you to appreciate the best landscapes of Machu Picchu in due time. This tour allows you to get to know the town of Aguas Calientes better. After visiting Machu Picchu, tourists can relax in the town’s thermal baths. Some tours combine the visit to Machu Picchu with other attractions: Machu Picchu + Sacred Valley, Machu Picchu + City Tour Cusco, etc. One of the ways to enjoy Machu Picchu to the fullest is through its hiking trails. These tours include tickets, camping equipment, food, tourist guide service and return transportation. Inca Trail Tour – 4 days and 3 nights walk to Machu Picchu through the ancient door used by the Incas (Sun Gate). Salkantay Tour – 5 day trek to Machu Picchu through the imposing Salkantay (6,721 masl). Lares Tour – 4-day trek to Machu Picchu touring traditional Andes towns of Cusco as Lares. Choquequirao Tour – Extreme 8-day trek that connects Cusco with the archaeological site of Choquequirao and from there to Machu Picchu. Tour Lima + Machu Picchu – This service includes a visit to the city of Lima (capital of Peru) and Machu Picchu in Cusco. Tour Arequipa + Machu Picchu – This service includes a visit to the famous ‘Colca Canyon’ in Arequipa as well as the Inca Citadel of Machu Picchu. Puno Tour + Machu Picchu – This service includes Machu Picchu as well as the city of Puno where tourists visit the ‘Lake Titicaca’. Each tourism agency establishes the prices of their tours to Machu Picchu according to the quality of their service. The best tour to Machu Picchu is one that meets the needs of the visitor. In Machu Picchu you will see some of the most impressive and enigmatic structures on the planet. Travelers from all over the world have had a love story with the Inca City since its discovery. Young people can choose the Inca Trail or any of the trekking routes to Machu Picchu. Visitors who come as a family can choose 1 or 2 day tours. Older adults can choose the 2-day tour that does not include climbing the Huayna Picchu. The tours to Machu Picchu are sold online. If you are in Lima you can also hire a tourist package in one of the many agencies that are in the capital of Peru. In the Historic Center of Cusco are located most of the tourism agencies that offer tours to Machu Picchu. You can also contact them online through their web pages. Most tours to Machu Picchu include tour guide. However, this service can also be obtained online. Older adults should choose a 2-day Machu Picchu tour as long as it does not include the climb to the Huayna Picchu mountain. If you travel to Machu Picchu accompanied by children you can choose the 2-day tour that includes the ascent to the mountain Machu Picchu. In addition, in the town of Santa Teresa there are thermal baths perfect to relax with the little ones. Both options are good to enjoy Machu Picchu. The tours are a good option to travel as a family. Young people can choose to travel on their own. In that case, they should purchase the Machu Picchu entrance online and in advance.